U.S. Senator Shelly Moore Capito greets Lynne Fruth, president of Fruth Pharmacy, as she comes to the lectern to speak at an event announcing the Fruth Bridge of Hope Fund. U.S. Senator Joe Manchin, III, speaks with Lynne Fruth, president of Fruth Pharmacy at the event. Pictured from left, Matt Boggs, executive director of Recovery Point, Senator Shelley Moore Capito, Senator Joe Manchin, Mayor of Huntington Steve Williams, Lynne Fruth, Dr. Michael Kilkenny, Cabell-Huntington Health Department, Dr. Michael Brumage, Kanawha-Charleston Health Department. All offered their support during the unveiling of the Bridge of Hope Fund. Fruth Pharmacy committed $20,000 to start the fund which will provide scholarships for people in recovery to seek education and job training. At the end of the announcement on Dec. 15, Fruth had several other entities contact her to offer support, bringing the starting amount of the fund up to $100,000. Fruth began discussing this idea with leaders from the Charleston and Huntington Health Departments, Recovery Point and The Greater Kanawha Valley Foundation. She has also reached out to friends and business associates in the pharmacy industry and members of the National Association of Chain Drug Stores to ask for their support. In response to that, Walgreens and Cardinal Health have already committed to a matching donation of $20,000 each to the fund. Cabell Huntington Hospital Foundation has also committed $20,000. For several years, Fruth has provided scholarships for graduates of the programs at Recovery Point. The Bridge of Hope Fund will help individuals who are in sustained recovery with job training or help them receive a traditional college degree. The Greater Kanawha Valley Foundation will administer the fund and the application process. People in recovery can apply for scholarship help to access training in trades like carpentry, HVAC and welding or certification in areas like cosmetology or massage therapy. Scholarships for more traditional areas like Community or Technical College and University courses will also be available. If you would like to donate to the Bridge of Hope Fund, you can visit The Greater Kanawha Valley fund online at tgkvf.org. Once there, hit the tab “Donate Now” button on the left menu or top of the screen, choose “OTHER” and type in the box Bridge of Hope Fund. You can also donate by calling 304-346-3620 or you can mail in your donation to: Bridge of Hope Fund c/o The Greater Kanawha Valley Foundation PO Box 3041, Charleston WV 25331. The application to apply for the Bridge of Hope scholarships will be available on both Fruth Pharmacy’s website: www.fruthpharmacy.com and The Greater Kanawha Valley Fund’s website: tgkvf.org by late February. Article submitted by Melanie Sherman on behalf of Fruth Pharmacy. https://www.mydailytribune.com/wp-content/uploads/sites/42/2017/12/web1_12.27-Fruth-2.jpgU.S. 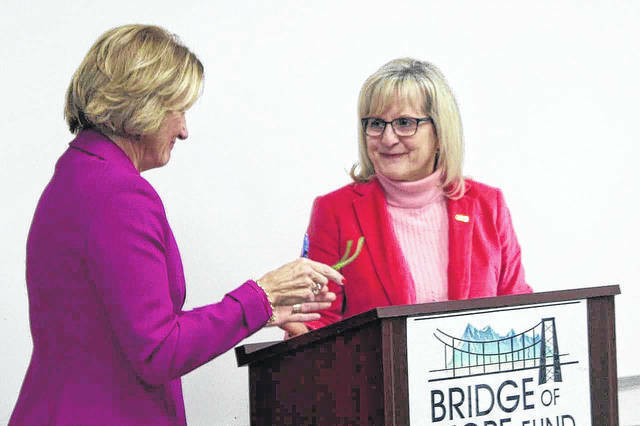 Senator Shelly Moore Capito greets Lynne Fruth, president of Fruth Pharmacy, as she comes to the lectern to speak at an event announcing the Fruth Bridge of Hope Fund. https://www.mydailytribune.com/wp-content/uploads/sites/42/2017/12/web1_12.27-Fruth-3.jpgU.S. 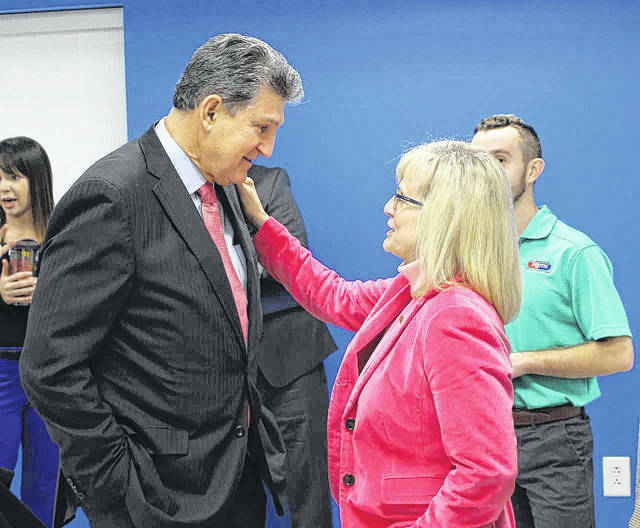 Senator Joe Manchin, III, speaks with Lynne Fruth, president of Fruth Pharmacy at the event. 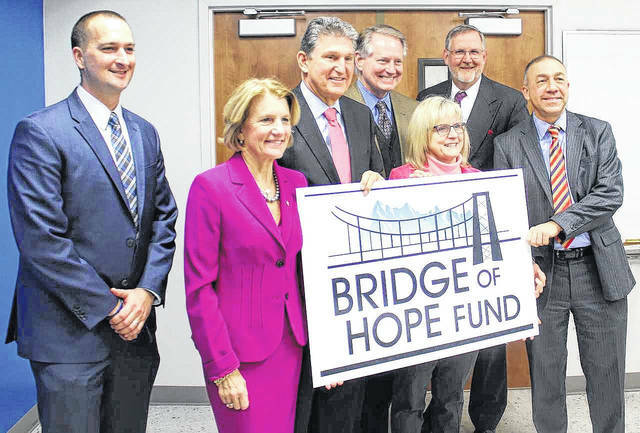 https://www.mydailytribune.com/wp-content/uploads/sites/42/2017/12/web1_12.27-Fruth.jpgPictured from left, Matt Boggs, executive director of Recovery Point, Senator Shelley Moore Capito, Senator Joe Manchin, Mayor of Huntington Steve Williams, Lynne Fruth, Dr. Michael Kilkenny, Cabell-Huntington Health Department, Dr. Michael Brumage, Kanawha-Charleston Health Department. All offered their support during the unveiling of the Bridge of Hope Fund.